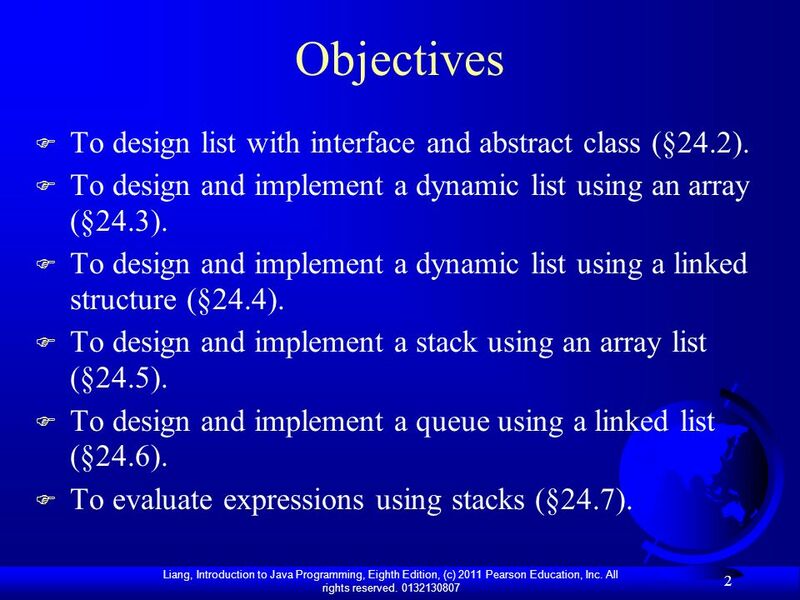 2 Objectives To design list with interface and abstract class (§24.2). 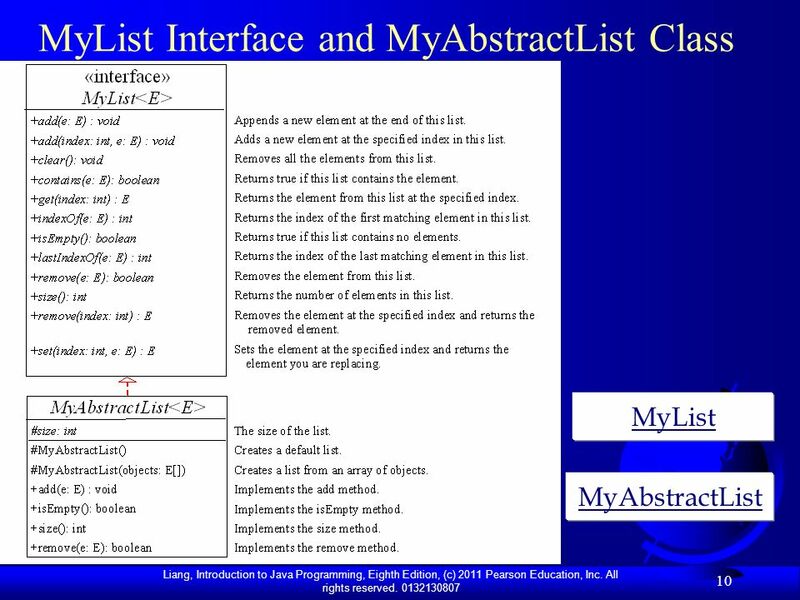 To design and implement a dynamic list using an array (§24.3). 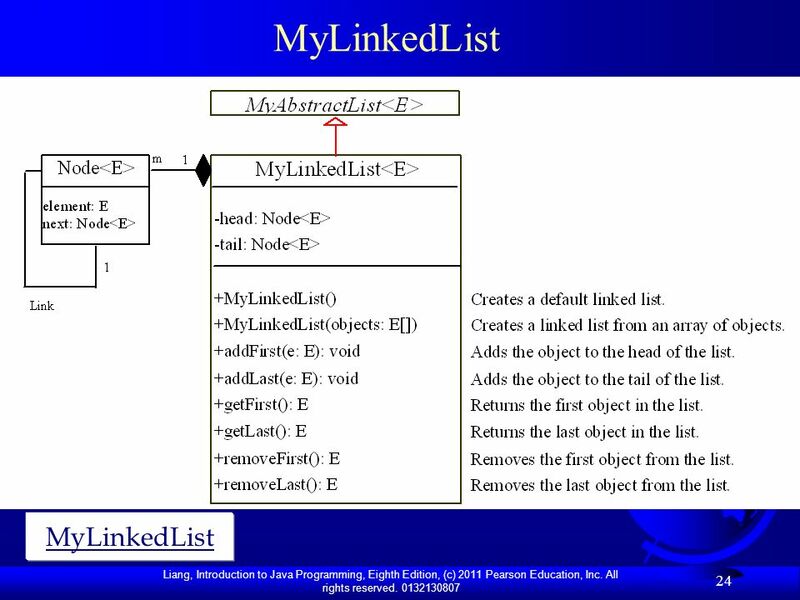 To design and implement a dynamic list using a linked structure (§24.4). 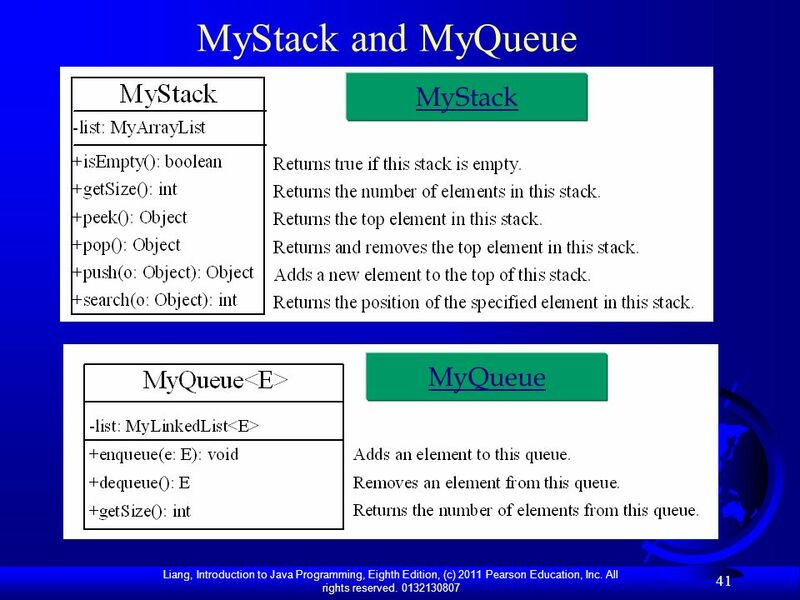 To design and implement a stack using an array list (§24.5). 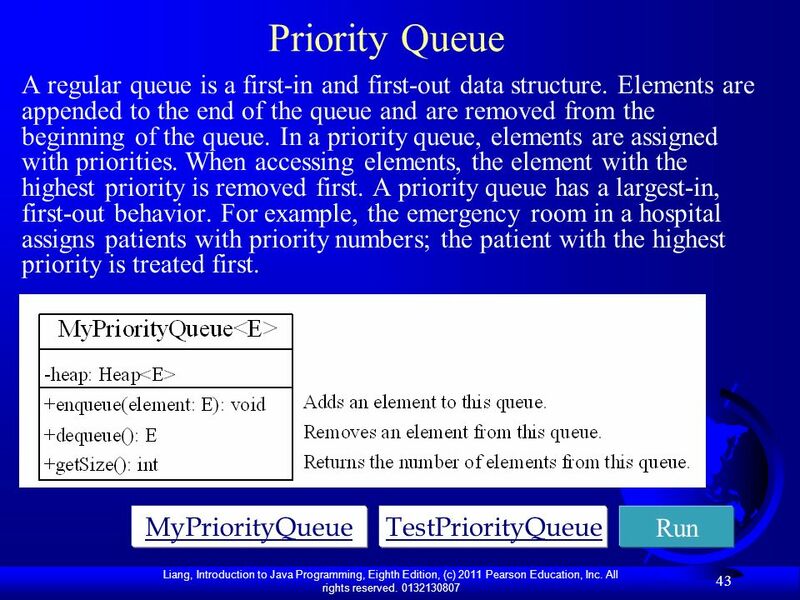 To design and implement a queue using a linked list (§24.6). To evaluate expressions using stacks (§24.7). 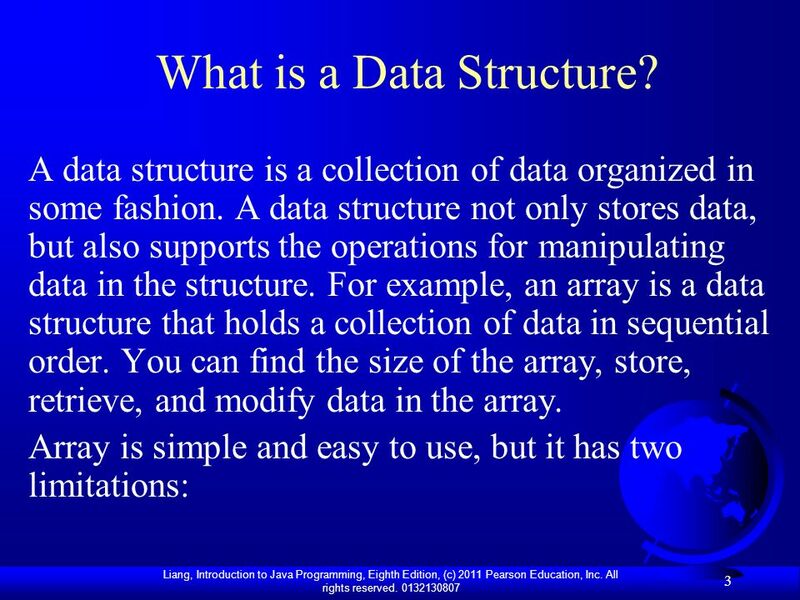 3 What is a Data Structure? 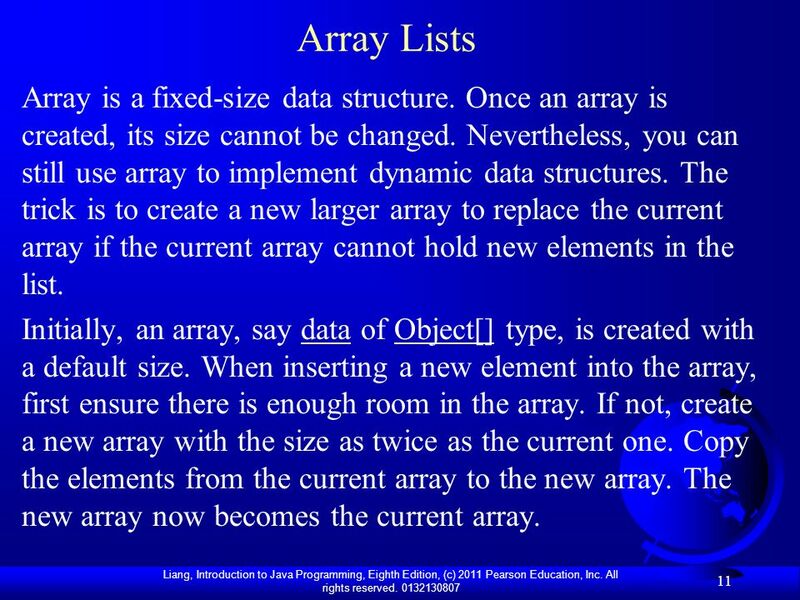 4 Limitations of arrays Once an array is created, its size cannot be altered. 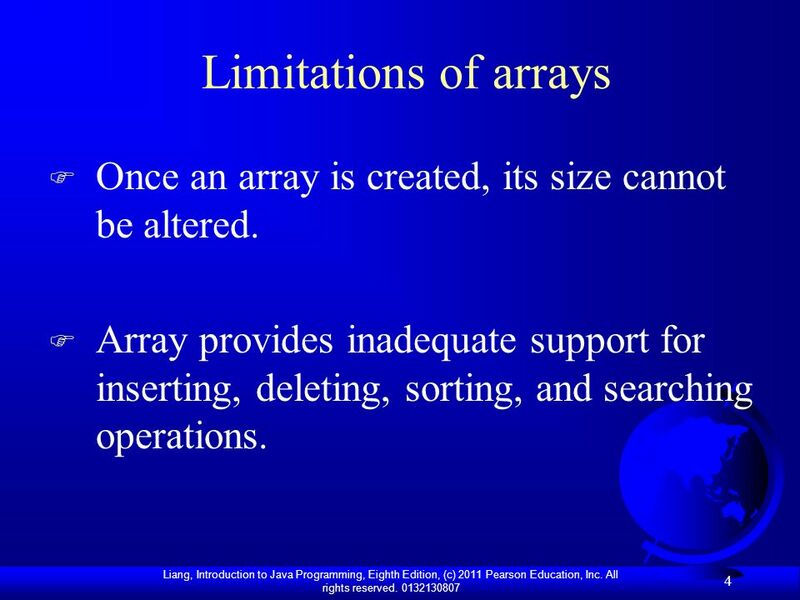 Array provides inadequate support for inserting, deleting, sorting, and searching operations. 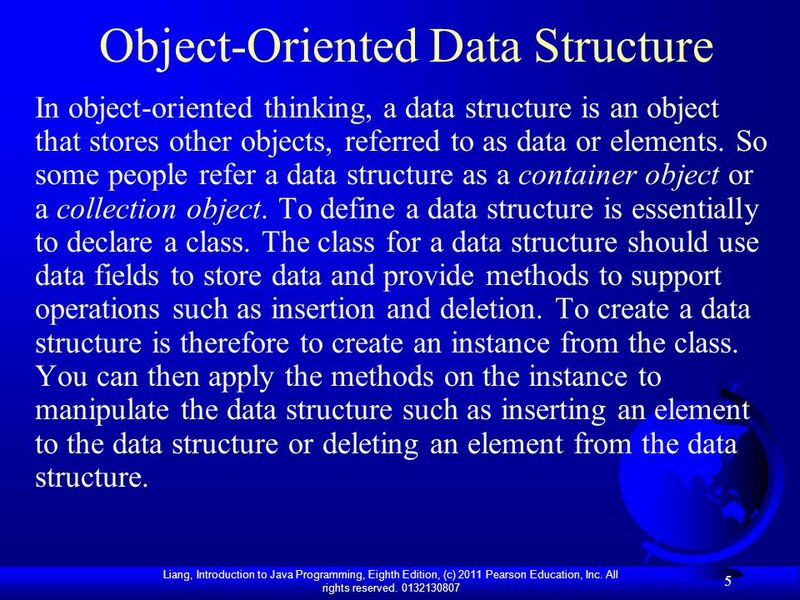 In object-oriented thinking, a data structure is an object that stores other objects, referred to as data or elements. So some people refer a data structure as a container object or a collection object. To define a data structure is essentially to declare a class. The class for a data structure should use data fields to store data and provide methods to support operations such as insertion and deletion. To create a data structure is therefore to create an instance from the class. 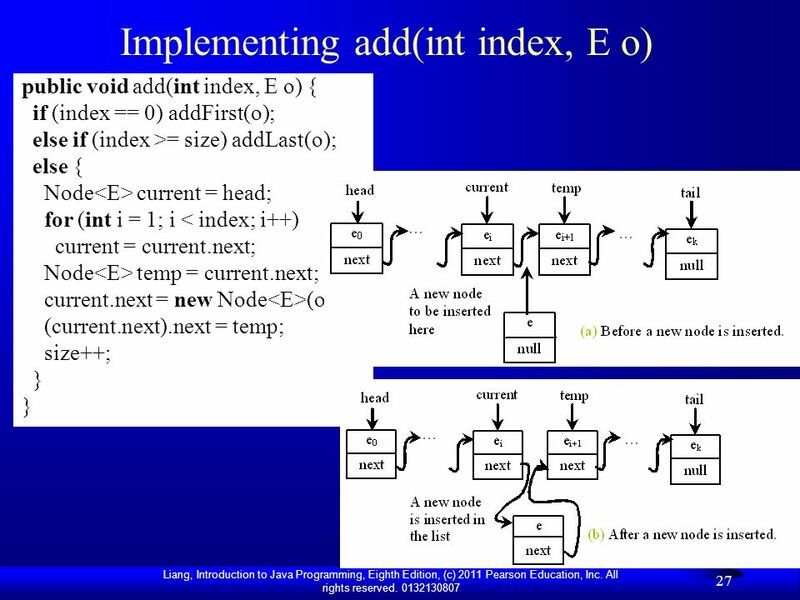 You can then apply the methods on the instance to manipulate the data structure such as inserting an element to the data structure or deleting an element from the data structure. 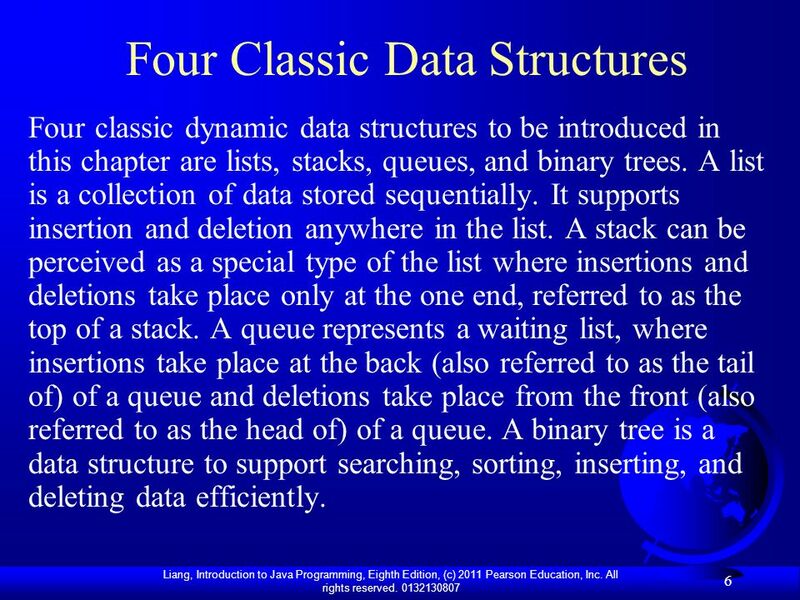 Four classic dynamic data structures to be introduced in this chapter are lists, stacks, queues, and binary trees. A list is a collection of data stored sequentially. It supports insertion and deletion anywhere in the list. 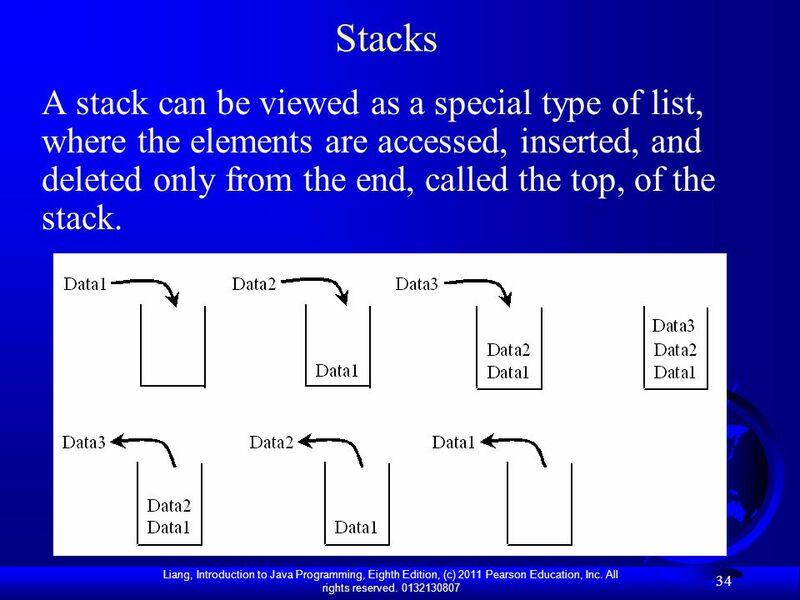 A stack can be perceived as a special type of the list where insertions and deletions take place only at the one end, referred to as the top of a stack. 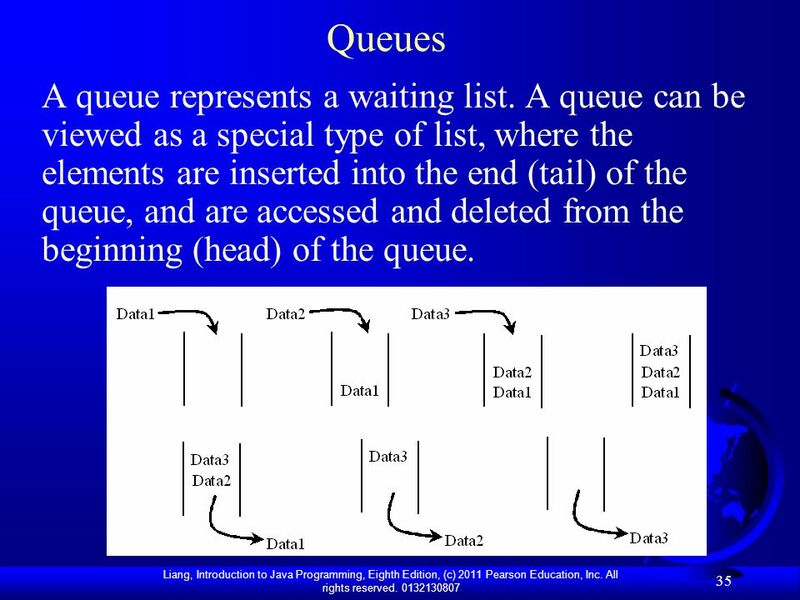 A queue represents a waiting list, where insertions take place at the back (also referred to as the tail of) of a queue and deletions take place from the front (also referred to as the head of) of a queue. A binary tree is a data structure to support searching, sorting, inserting, and deleting data efficiently. 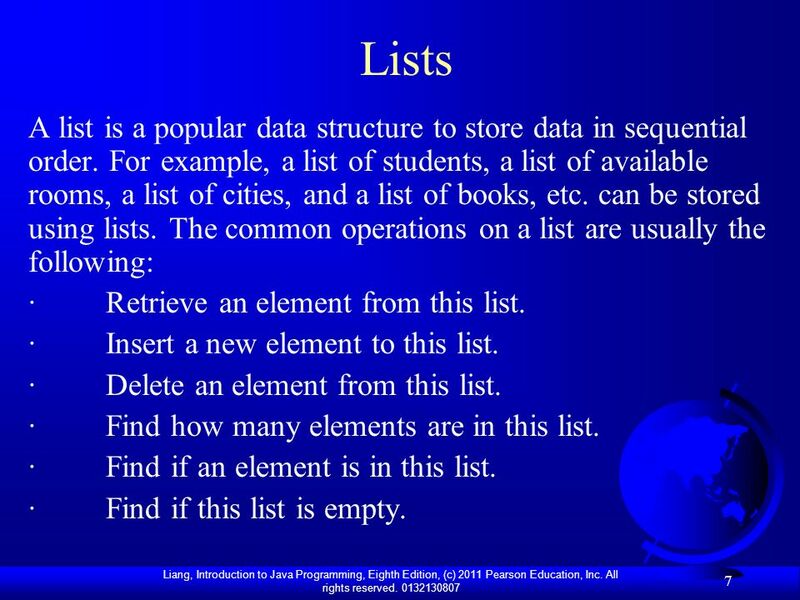 7 Lists A list is a popular data structure to store data in sequential order. For example, a list of students, a list of available rooms, a list of cities, and a list of books, etc. 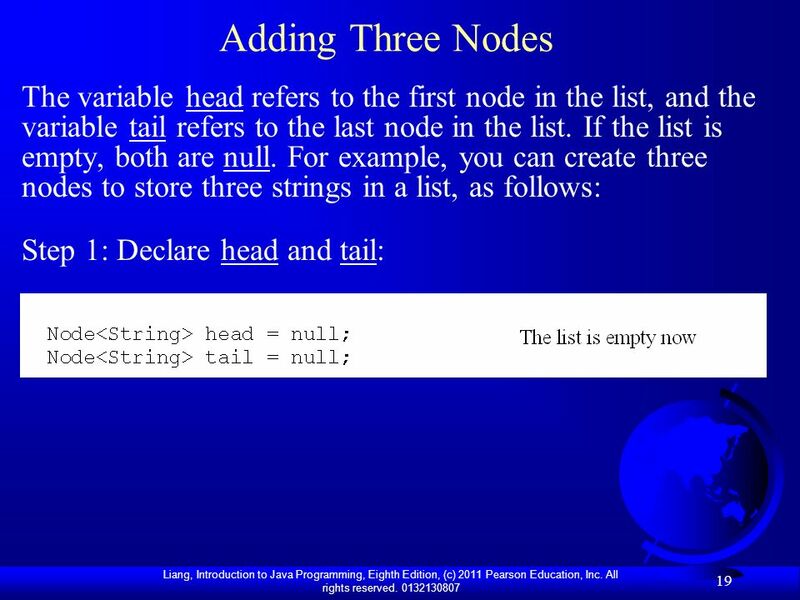 can be stored using lists. 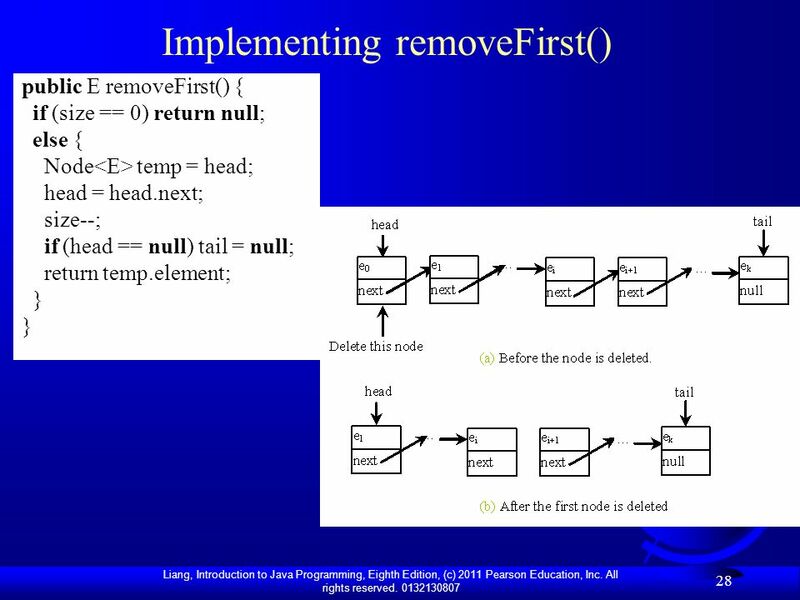 The common operations on a list are usually the following: · Retrieve an element from this list. · Insert a new element to this list. · Delete an element from this list. 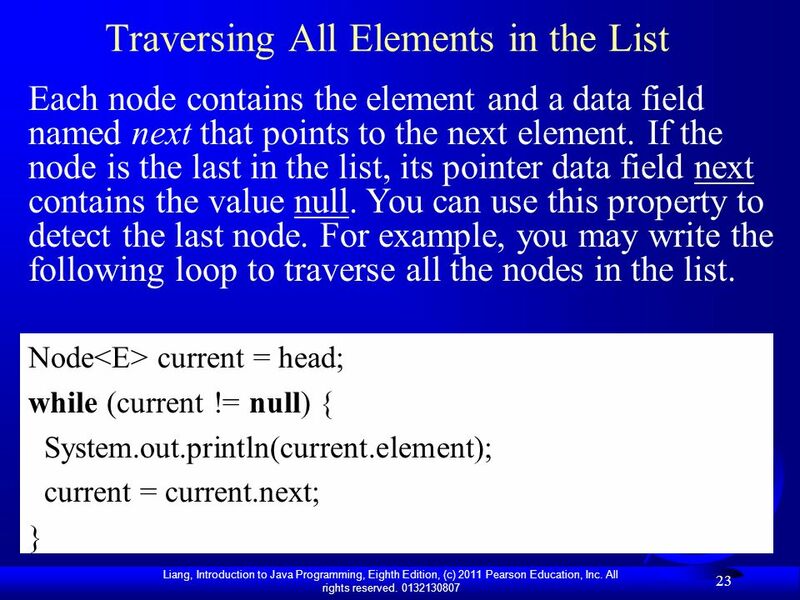 · Find how many elements are in this list. · Find if an element is in this list. · Find if this list is empty. 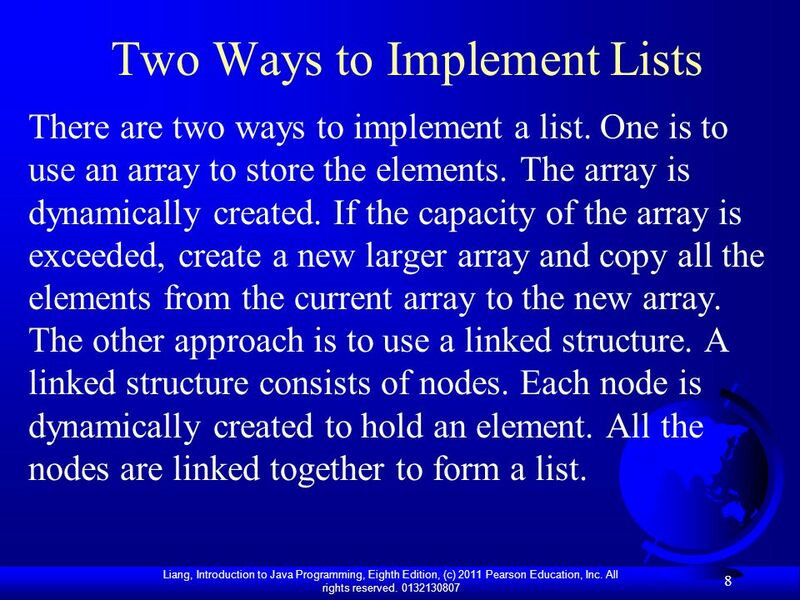 There are two ways to implement a list. One is to use an array to store the elements. The array is dynamically created. If the capacity of the array is exceeded, create a new larger array and copy all the elements from the current array to the new array. The other approach is to use a linked structure. 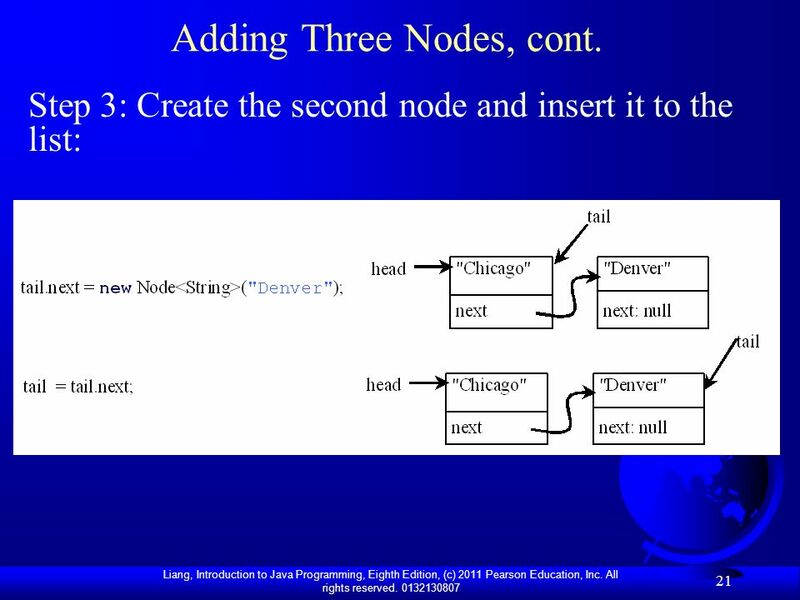 A linked structure consists of nodes. Each node is dynamically created to hold an element. 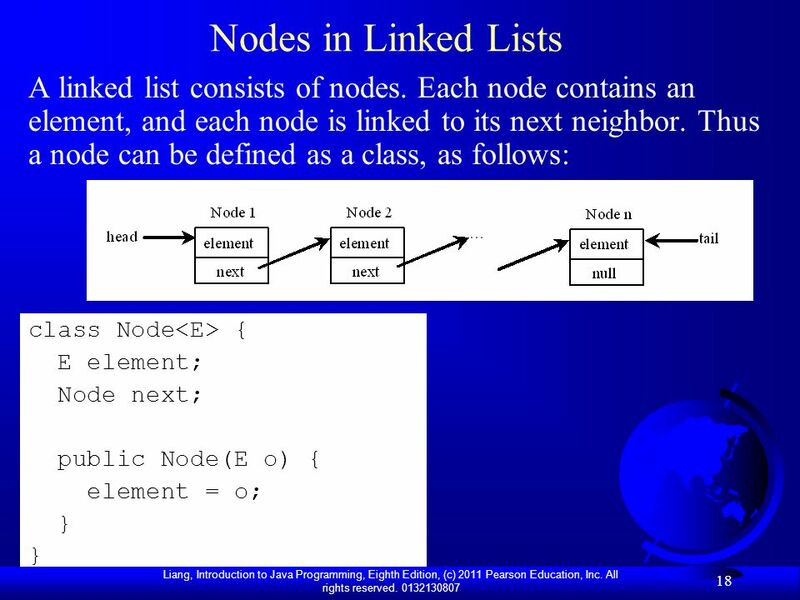 All the nodes are linked together to form a list. 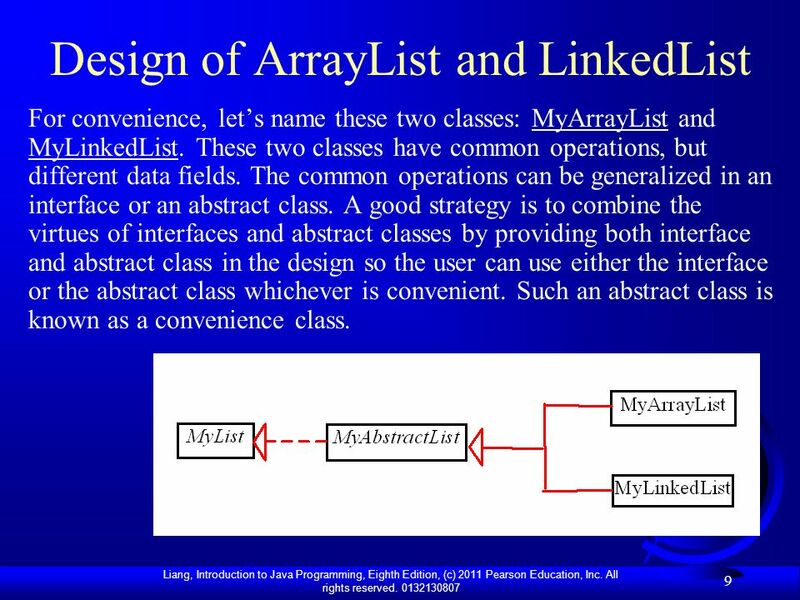 For convenience, let’s name these two classes: MyArrayList and MyLinkedList. These two classes have common operations, but different data fields. 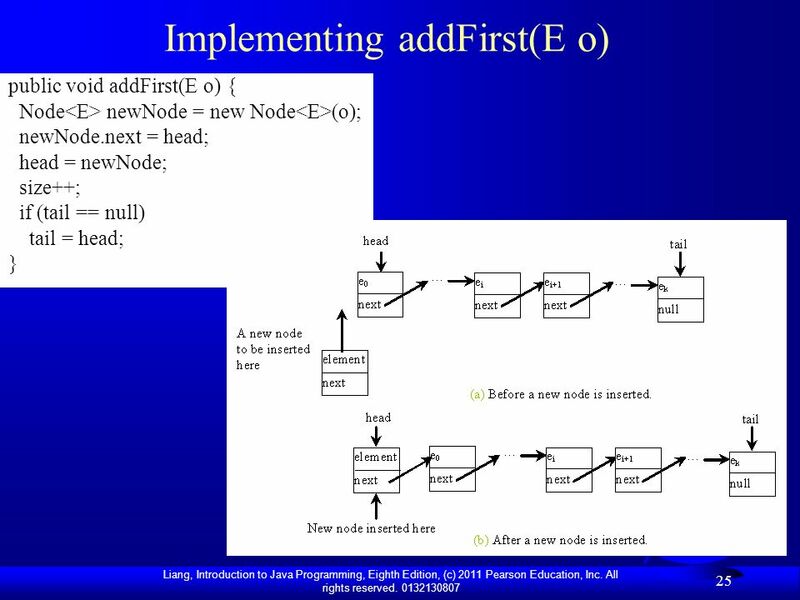 The common operations can be generalized in an interface or an abstract class. A good strategy is to combine the virtues of interfaces and abstract classes by providing both interface and abstract class in the design so the user can use either the interface or the abstract class whichever is convenient. Such an abstract class is known as a convenience class. 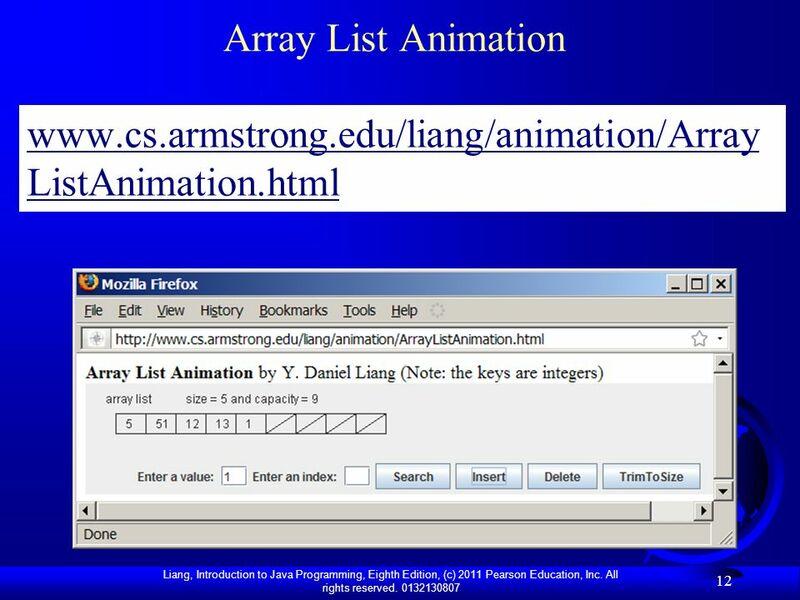 11 Array Lists Array is a fixed-size data structure. Once an array is created, its size cannot be changed. Nevertheless, you can still use array to implement dynamic data structures. 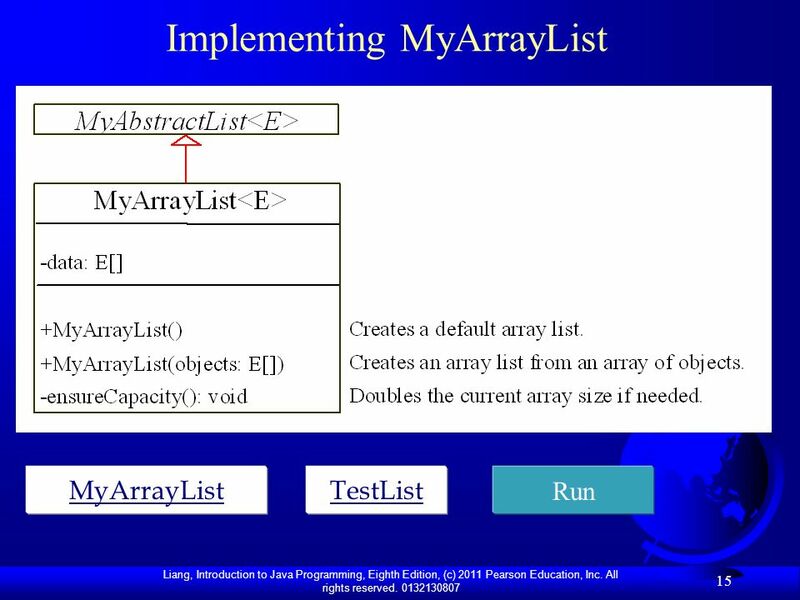 The trick is to create a new larger array to replace the current array if the current array cannot hold new elements in the list. Initially, an array, say data of Object type, is created with a default size. When inserting a new element into the array, first ensure there is enough room in the array. If not, create a new array with the size as twice as the current one. Copy the elements from the current array to the new array. The new array now becomes the current array. 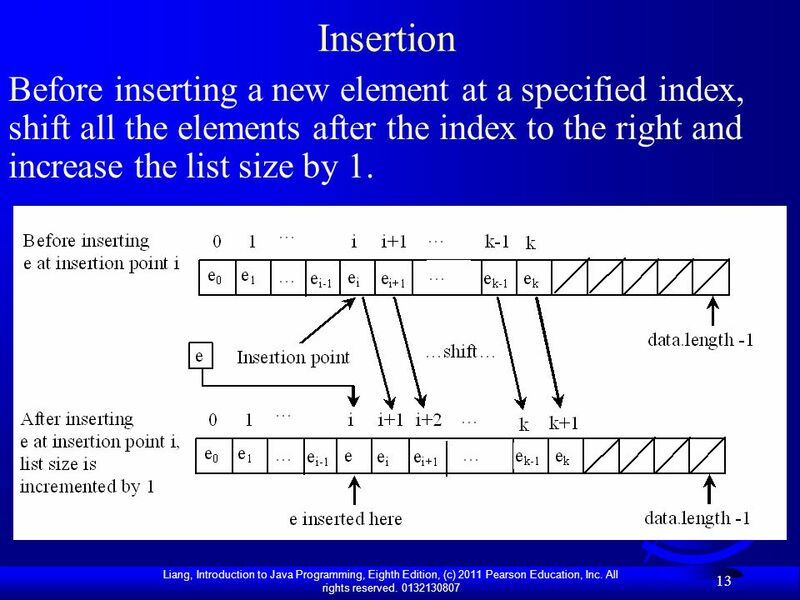 13 Insertion Before inserting a new element at a specified index, shift all the elements after the index to the right and increase the list size by 1. 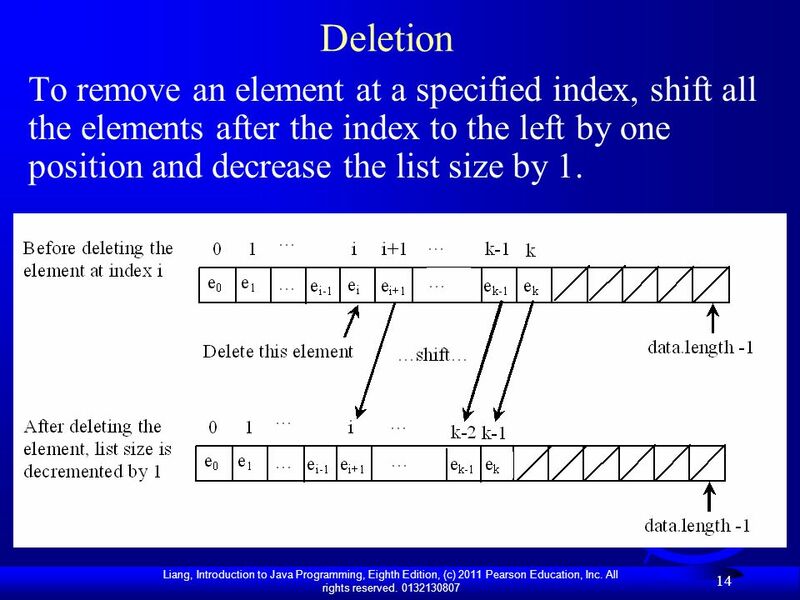 14 Deletion To remove an element at a specified index, shift all the elements after the index to the left by one position and decrease the list size by 1. 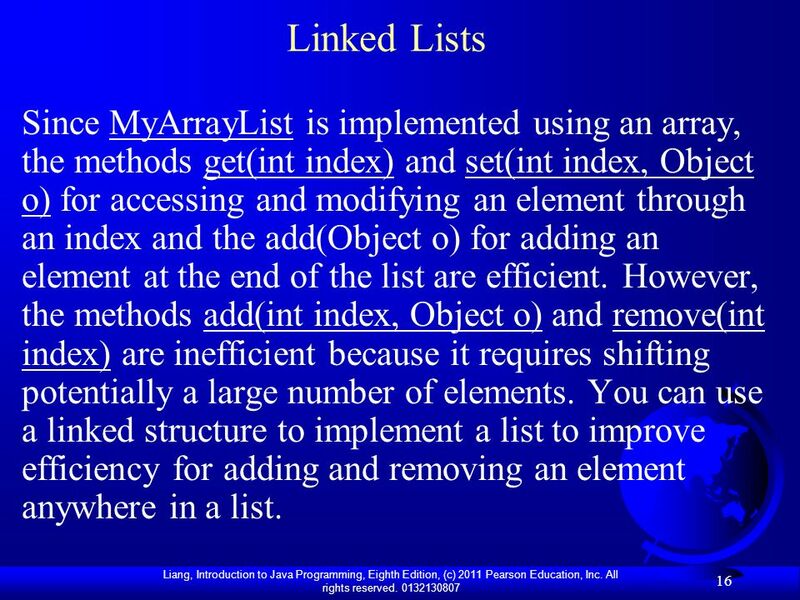 16 Linked Lists Since MyArrayList is implemented using an array, the methods get(int index) and set(int index, Object o) for accessing and modifying an element through an index and the add(Object o) for adding an element at the end of the list are efficient. 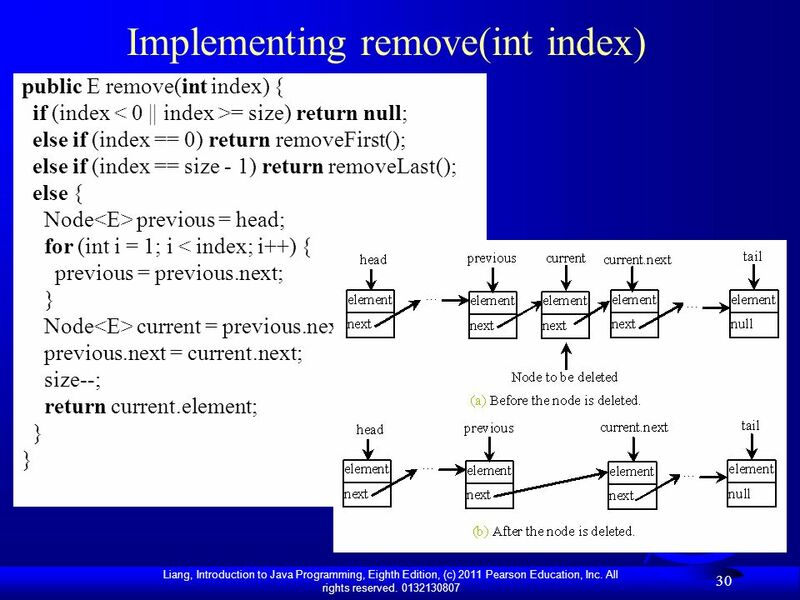 However, the methods add(int index, Object o) and remove(int index) are inefficient because it requires shifting potentially a large number of elements. 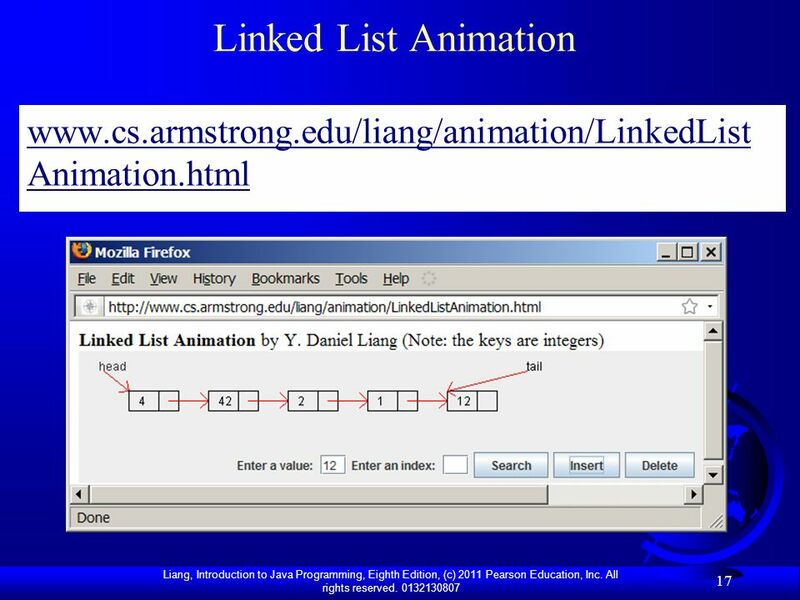 You can use a linked structure to implement a list to improve efficiency for adding and removing an element anywhere in a list. 20 Adding Three Nodes, cont. 21 Adding Three Nodes, cont. 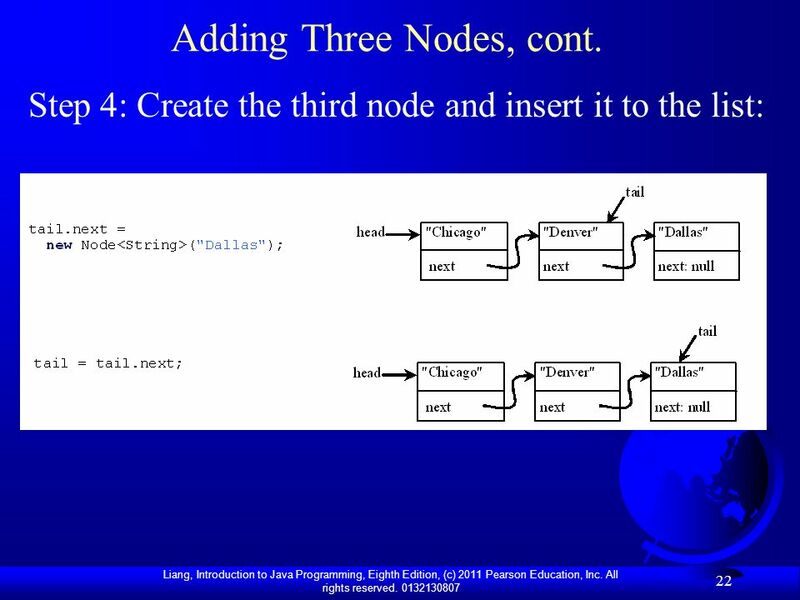 22 Adding Three Nodes, cont. 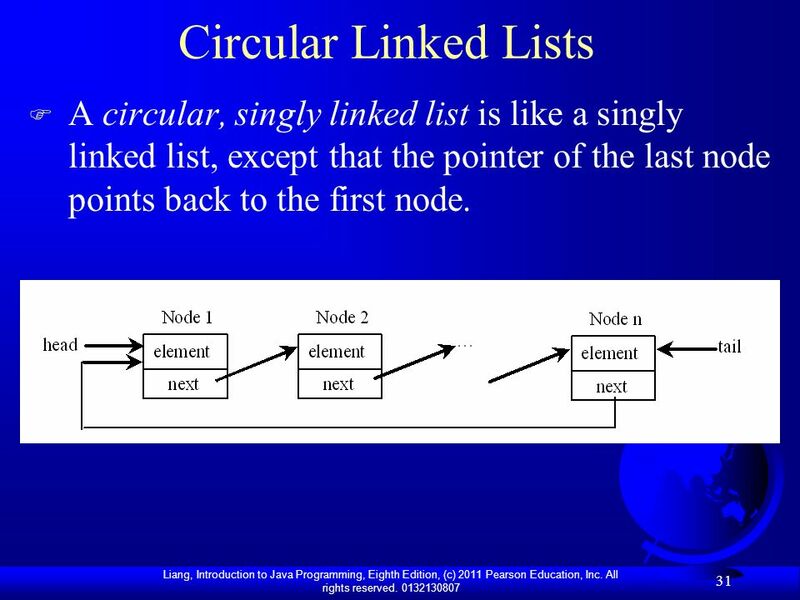 31 Circular Linked Lists A circular, singly linked list is like a singly linked list, except that the pointer of the last node points back to the first node. 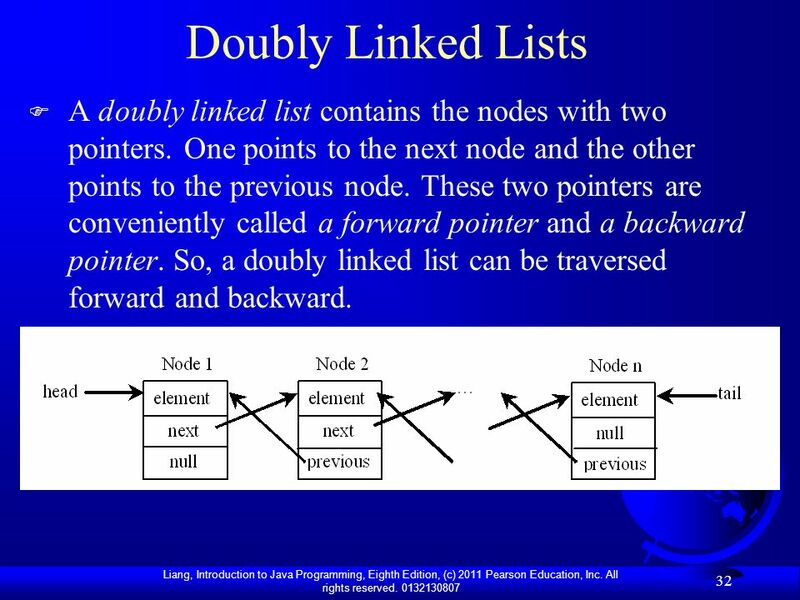 32 Doubly Linked Lists A doubly linked list contains the nodes with two pointers. 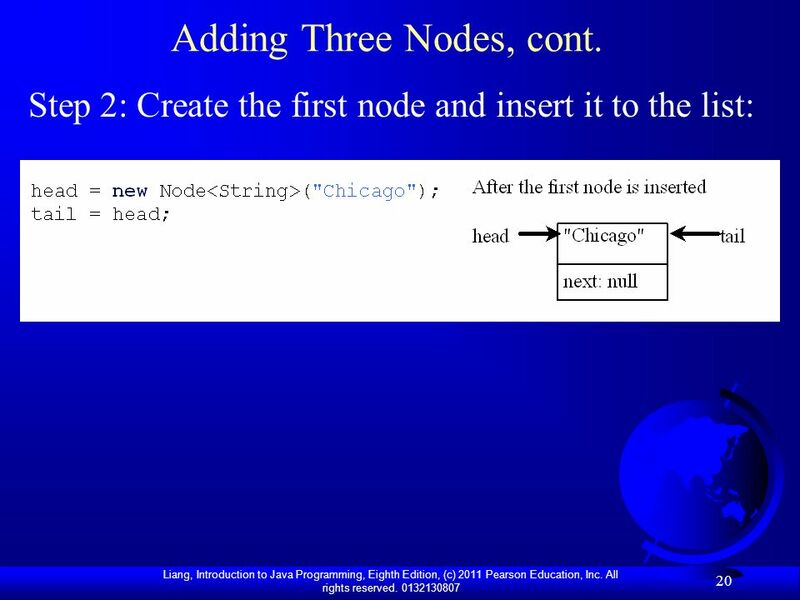 One points to the next node and the other points to the previous node. These two pointers are conveniently called a forward pointer and a backward pointer. 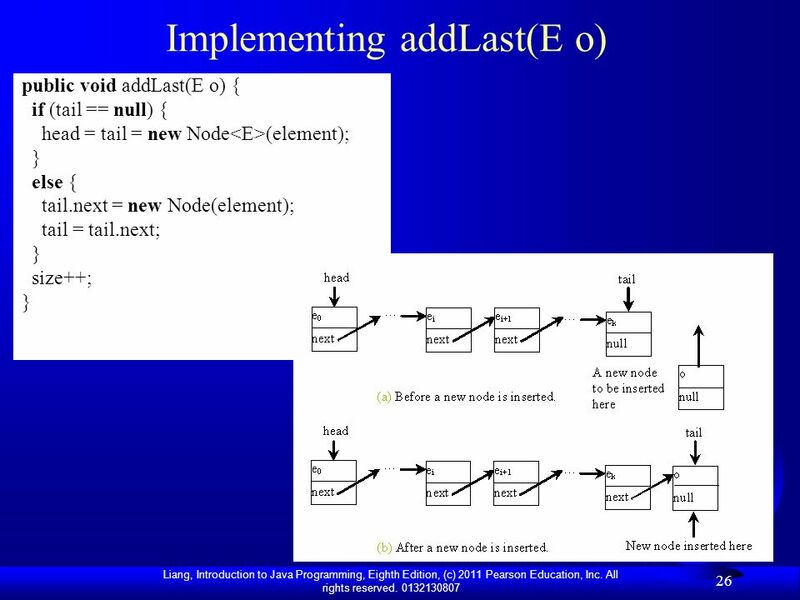 So, a doubly linked list can be traversed forward and backward. 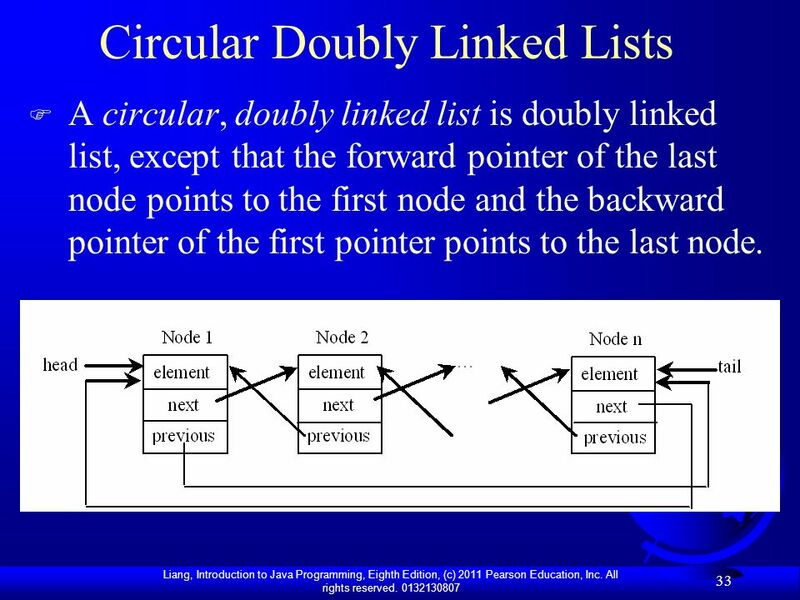 A circular, doubly linked list is doubly linked list, except that the forward pointer of the last node points to the first node and the backward pointer of the first pointer points to the last node. 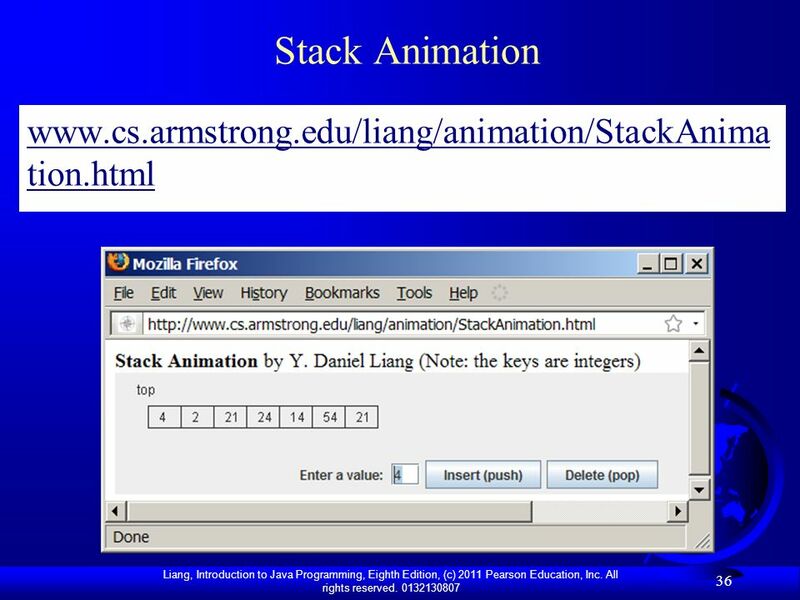 34 Stacks A stack can be viewed as a special type of list, where the elements are accessed, inserted, and deleted only from the end, called the top, of the stack. 35 Queues A queue represents a waiting list. 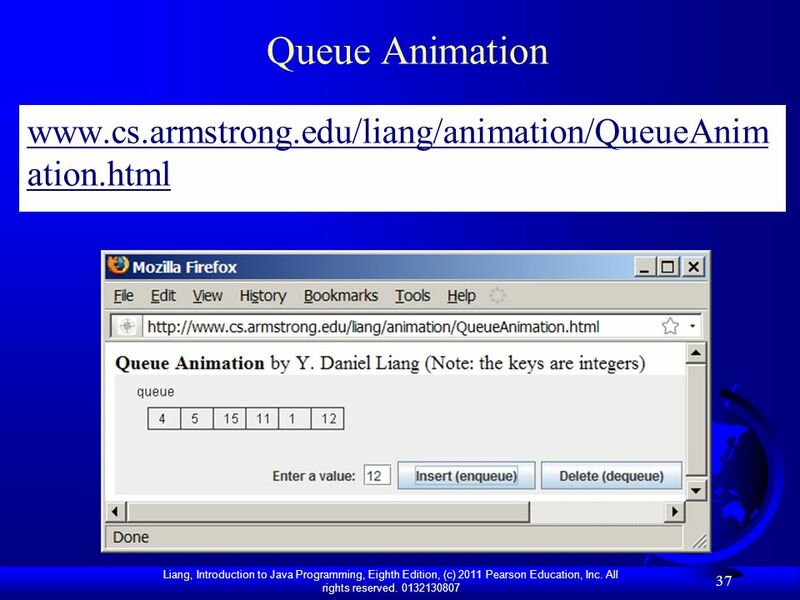 A queue can be viewed as a special type of list, where the elements are inserted into the end (tail) of the queue, and are accessed and deleted from the beginning (head) of the queue. 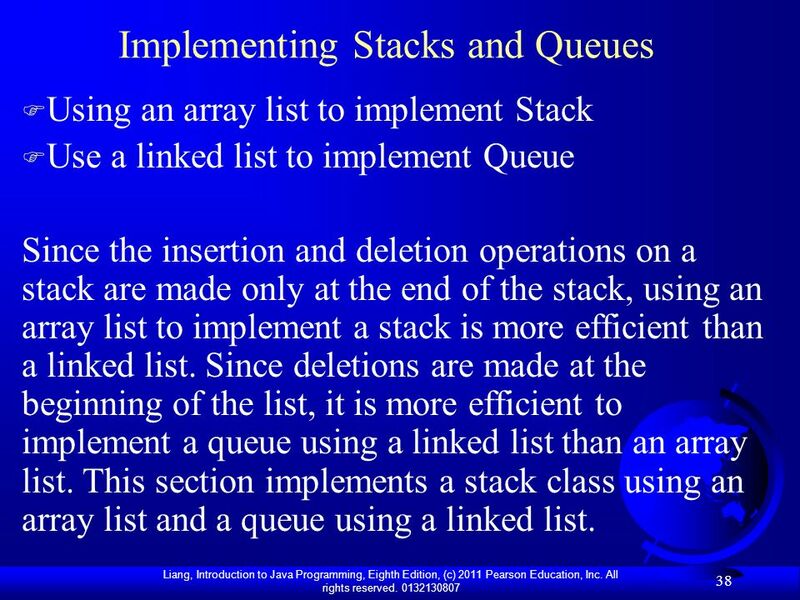 Using an array list to implement Stack Use a linked list to implement Queue Since the insertion and deletion operations on a stack are made only at the end of the stack, using an array list to implement a stack is more efficient than a linked list. 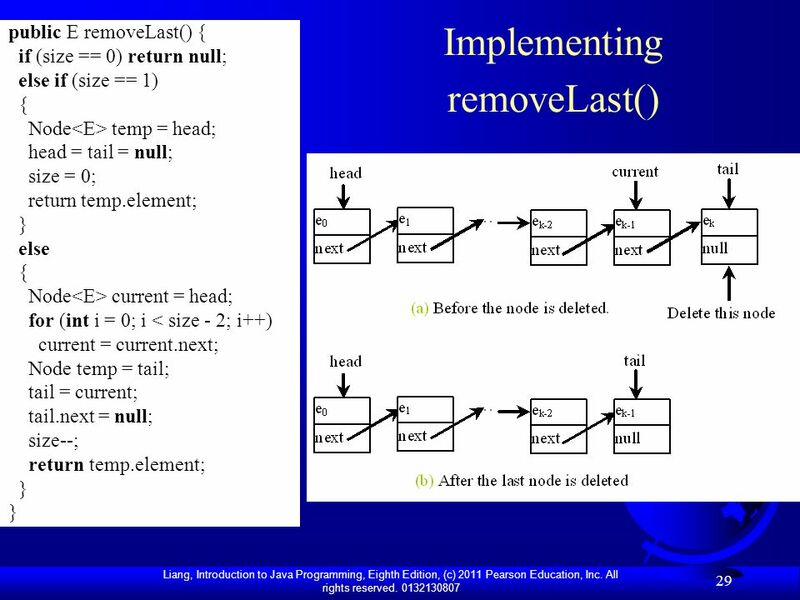 Since deletions are made at the beginning of the list, it is more efficient to implement a queue using a linked list than an array list. 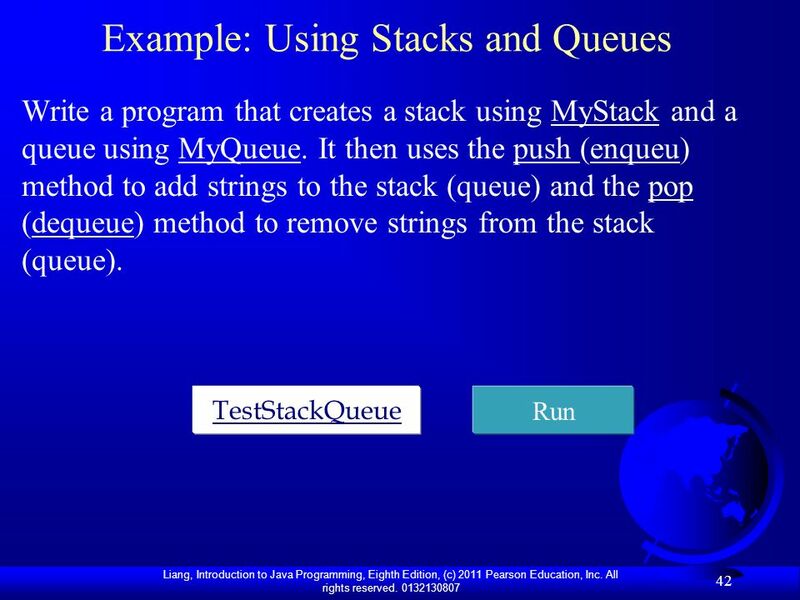 This section implements a stack class using an array list and a queue using a linked list. 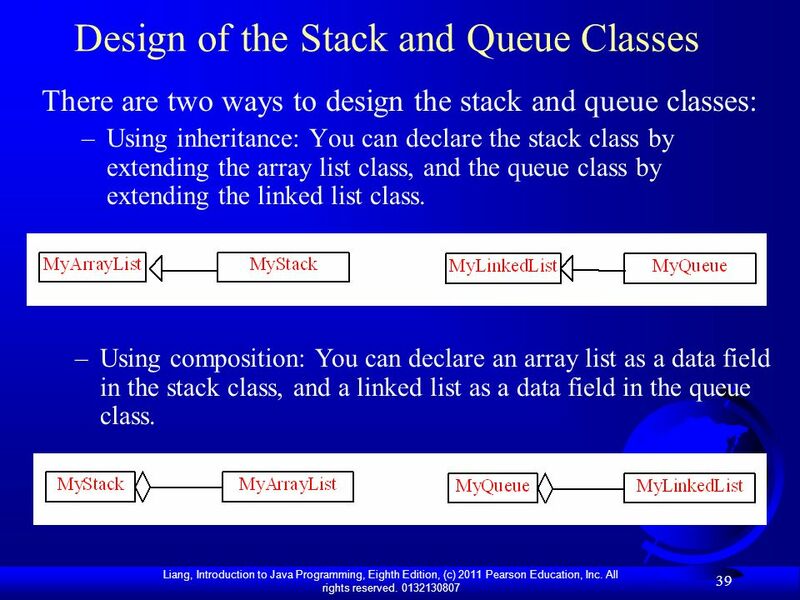 There are two ways to design the stack and queue classes: Using inheritance: You can declare the stack class by extending the array list class, and the queue class by extending the linked list class. Using composition: You can declare an array list as a data field in the stack class, and a linked list as a data field in the queue class. 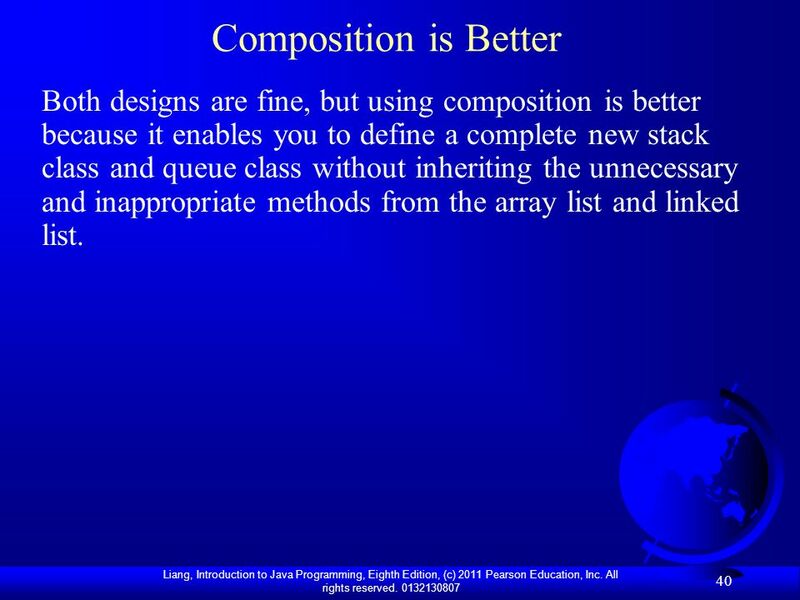 40 Composition is Better Both designs are fine, but using composition is better because it enables you to define a complete new stack class and queue class without inheriting the unnecessary and inappropriate methods from the array list and linked list. 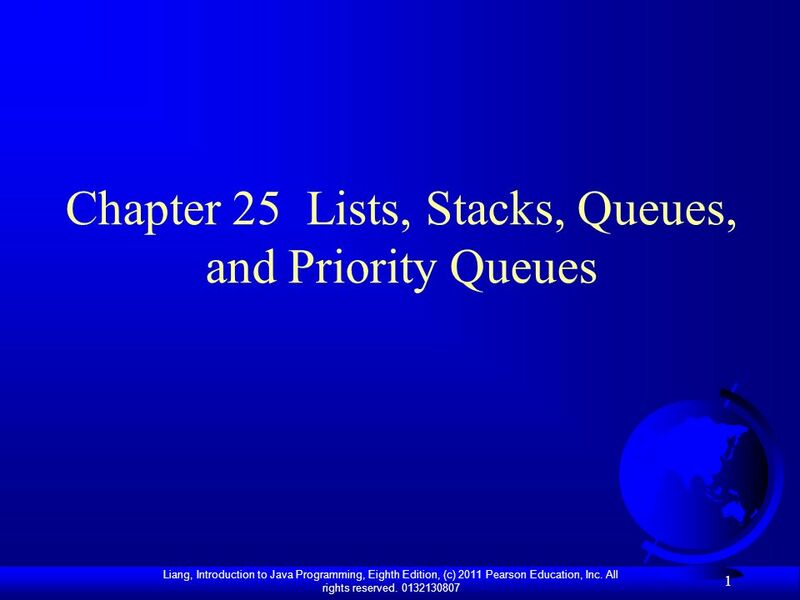 Download ppt "Chapter 25 Lists, Stacks, Queues, and Priority Queues"
Topic 12 The List ADT. 9-2 Objectives Examine list processing and various ordering techniques Define a list abstract data type Examine various list implementations.